D Soldierz | OK Listen! D Soldierz is a Multi-Genre Mainstream Punjabi Music Duo formed by Singer/Songwriter Anupam Aditya Sharma aka "Magik Eleven" and Rapper/Lyricist Apurav Aditya Sharma aka "O Pozitive" originating from New Delhi, India. 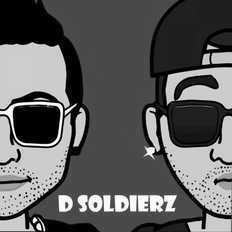 D Soldierz emerged on the Indian Music Scene by independently releasing several English-Punjabi underground tracks in the genre of Dance, HipHop & R&B which included 2 mixtapes "Six Men Army" , "Real Dreamz" and a Debut Commercial Punjabi Album RE - EVOLUTION on T Series Music.